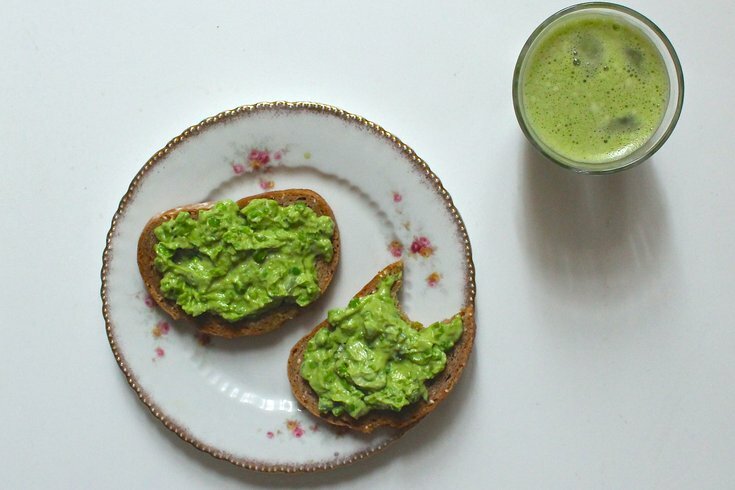 Teaspoons & Petals writer Alexis Siemons shares two spring-inspired matcha recipes. Consider this sweetened vanilla latte a healthy twist on green tea ice cream, swapping cream for almond milk. The nuttiness of the almond milk pairs well with the rich, full-bodied culinary-grade matcha, balanced by indulgent vanilla and agave for sweet notes. If honey or sugar are your sweeteners of choice, simply heat the almond milk and stir in the sweetener until dissolved, then chill before mixing with the matcha. In a 16-ounce mason jar or other larger airtight container, add the matcha (sift matcha for a smoother consistency). Stir in hot water to help disperse the matcha. Stir in the agave and vanilla. Add the ice and pour in the almond milk. Seal the jar and shake vigorously for 1 minute. Serve immediately; matcha will settle after a minute or so and may need a second shake. Send in spring with the sweet notes of peas, fresh anise-like flavors of tarragon and rich and tangy crème fraîche that are given a vibrant green burst of color and umami flavor with the addition of matcha. Spread the mélange on toasted baguette slices for creamy and crunchy crostini that make for the perfect lunch bite or afternoon snack, best paired with a cup of tea. Heat oven to 350 degrees. Place the bread slices on a parchment paper–lined baking sheet. Drizzle bread with olive oil and sprinkle with a pinch of salt. Toast in the oven for 15 minutes, or until slightly crisp; let cool. In a small bowl, mash peas. Stir in crème fraîche, tarragon and honey. Sift the matcha into the crème fraîche mixture and stir until fully incorporated. Spread on the toasted bread and serve immediately. Note: You can make the crostini ahead of time and store in an airtight container. Store the crème fraîche mixture, minus the matcha, in a separate container in the refrigerator. Stir in the matcha just before serving.